Come get colourful with the North Lakes 5k Colour Frenzy Team! 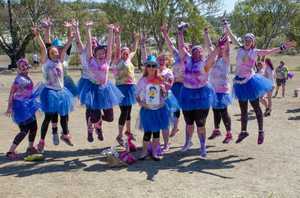 The Colour Frenzy fun walk / run is back bigger and brighter then ever! Dont miss out! The North Lakes 5k Colour Frenzy is back! Sunday 14th of April 2019 we will have our Colour Frenzy 5k Fun Walk or Run at Lake Eden in North Lakes. Tickets go on sale on Friday the 15th of February 2019, Early bird prices available until sold out. Limited tickets available for the day. Race pack collection from 7:30am with the fun walk / run starting at 8:30am. Race pack (Wrist bands, Safety Glasses and Personal Powder Chalk packet) collections also available on Saturday the day before. Limited tickets available for each wave, don't miss out. Our last event sold out! We will have a 1.7km track marked out for everyone to follow with multiple colourful zones along the way. You can complete up to 3 laps. You can Walk, Jog, Run or a mix of it all. It’s completely self-paced. Tickets go on sale 15th of February at 9am from www.northlakescolourfrenzy.com.au. Limited tickets available. #LetsGetColourful!